Home | Mitchell, William L.
U.S. automotive designer who was born in Cleveland and grew up in Greenville, PA. His father was a Buick dealer and he loved both drawing and driving sports cars. He began work in 1927 as a commercial artist in New York for the Barron Collier advertising agency, then studied art at Carnegie Institute of Technology in 1930, and the Art Students League of New York from 1930 to 1931. When he contacted Harley Earl, Earl was impressed with his sketches of racing cars and hired him in the General Motors Art & Colour Section in December 1935. He worked in the Cadillac studio, where he designed the classic Cadillac script logo. He was named chief Cadillac designer in 1937 and designed the 1938 Cadillac 60 Special, which was a big success. He became Harley Earl’s protégé and in December 1958, succeeded Earl as vice president for styling, just at the time that Earl’s garish chromed and tail-finned 20-year era had run its course. Mitchell favored smoothly sculptured, unadorned shapes, and GM’s cars were transformed into more sophisticated designs. Under Mitchell’s direction came the 1963 Buick Riviera, the 1963 Corvette Stingray, the 1968 Chevrolet Camero, and the 1976 Cadillac Seville. 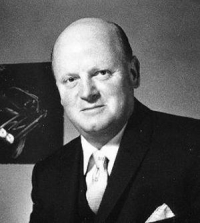 He retired in 1977 after 42 years, but oversaw GM’s downsized full-sized and intermediate-sized cars of 1977 and 1978. After retirement, he operated a private consulting design firm, William L. Mitchell Design, from 1977 to 1984.